I Didn't Give Hawaii Energy Permission To Use My Data - Did You? I Didn’t Give Hawaii Energy Permission To Use My Data — Did You? The state-contracted business data-mines your details on energy use without your approval and then scolds you in a report. I got a target letter last week, and it wasn’t from the FBI. 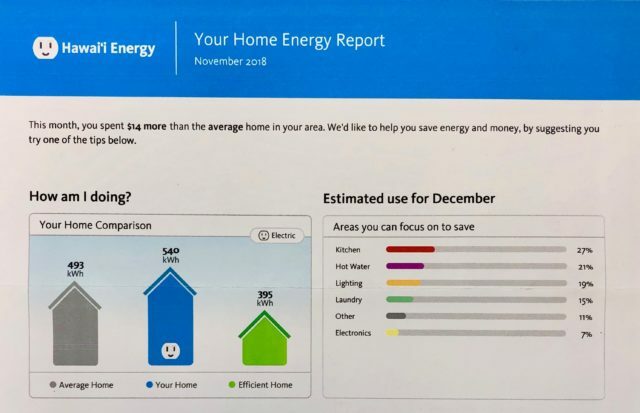 It was a “Home Energy Report” from Hawaii Energy. Although I never asked it to, Hawaii Energy compared my energy use with 3,855 similar homes in my area, all constructed around 1970, and concluded I did not, sadly, qualify as an average home — much less an efficient one. Perhaps I should consider a solar water heater? My immediate reaction was wait, this is all wrong. My house went up in 1935, and there aren’t 3,855 homes (much less people) on all of Lanai, so where are the homes in my area I was compared to? And if it knows so much, how did Hawaii Energy not know I already have a solar hot water heater? Excerpt from a recent a “Home Energy Report” from Hawaii Energy. What brilliant psychology, I thought: Using customer data customers never said it could have or use, Hawaii Energy compares your energy use to unidentified other customers’ use, finds you deficient, and makes you feel compelled to provide more accurate information — so it can get better at using your energy data to scold you about the energy you use. I know Maui Electric knows how much electricity we use — how else could MECO bill us — but how did Hawaii Energy get my information? More to the point, who gave it permission to analyze my data and use it as part of a shame campaign? Turns out, no one did. This all started back in 2008 when the “Clean Energy Initiative” (which also gave us the Big Wind disaster and was mercifully rescinded in 2014) transferred energy efficiency programs out of utility control and placed them with a third party, to be called a public benefits fee administrator paid for by a fee collected from customers. Hawaii’s Public Utilities Commission issued a proposal to run the public benefits fee programs; a company called LEIDOS (formerly SAIC) won the bid in March 2009; and a month later the PUC told the utilities to hand over customer data to what would become Hawaii Energy. Setting aside the barb that we need help reading our own electric bills, it appears that at no point in 2009 — nor at any time since — did anyone think to ask us, the customers, if we wanted our private data to stay private, or if we should have been given a choice to opt-out of having it analyzed and used without our permission. Hawaii Energy’s executive director Brian Kealoha relies on the 2009 PUC order to justify why customers can’t opt-out of having their personal data transferred, but he offered no explanation for why we have no say in how our data is used once Hawaii Energy gets it. Really? I missed that, so I went back to my Home Energy Report to see where it advised me of that option. I found four separate appeals to “correct” “update” and “improve” my energy profile but not a single word on how to opt-out of the report altogether. There’s no way to know if such advanced detection will be used against us and our toaster-ovens, but last year Hawaii Energy said it intends to “markedly improve” data analytics used to target customers. I hope you didn’t miss the part where you are paying for this. Every month (unless you live on Kauai) a surcharge is tacked on your monthly bill based on how much energy (kWh) you used. The money collected supports Hawaii Energy’s efficiency programs, and each year it submits a performance award claim based on how well its goals were met. Of course we all should aspire to save energy, it’s good for the planet and for our electric bills. And I know for a fact that Hawaii Energy has wonderful programs and incentives: Marketing Manager Doi made a point to look me up and remind me that I got an efficiency rebate back in 2012. But I will be opting-out of the factually deficient Home Energy Report I never asked for, and since Hawaii Energy never asked me if it could use my data to target you, I’ll be sending a letter demanding that this stops. If you enjoy your Home Energy Report, great. But if you feel like just saying no — until Hawaii Energy (or someone, anyone) asks you to say yes — here’s the number to call: (877) 231-8222. 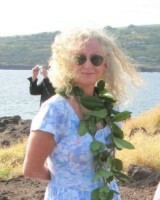 Sally Kaye is a resident of Lanai, an editor and former prosecutor.